‘Herons Rest’ is a beautiful 3 bedroom, 2 bathroom Executive villa on the peaceful community of Sunridge Woods. It’s situated on a large corner plot overlooking a pond. The Kitchen is fully fitted with Dishwasher, oven, built in Microwave, Fridge Freezer, coffee maker, blender, toaster, waste disposal, pots, pans, crockery, cutlery & glassware. Breakfast bar with 3 swivel stools. The spacious Family Room has a 3 seater settee, 2 seater settee, 3 coffee tables, a large 51'' plasma TV, along with a Computer for guest use, DVD/CD player and library of DVD's for all the family. Telephone & ceiling fan. Patio doors lead out to the pool deck. 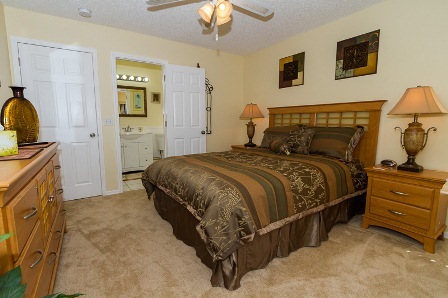 The Master Bedroom has an extra large King-size bed, dressing table & walk in wardrobe. 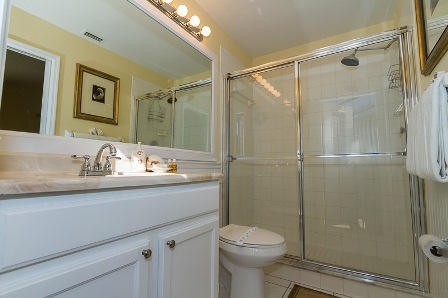 The en-suite bathroom has a walk-in shower and a door leading out to the pool deck. There is a 32'' flat screen TV with built in DVD player, telephone and ceiling fan. The second Master has a queen size bed, dressing table, large wardrobe and 26'' flat screen TV with built in DVD player & ceiling fan. A spacious twin bedroom has dressing table and 26'' Flat screen TV with built in DVD player, Xbox 360 with a selection of games. Ceiling fan. 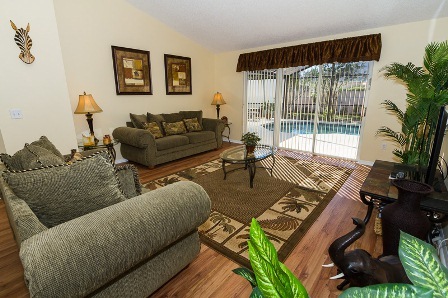 The pool has an extended deck with large lanai, which easily accommodates a large table and chairs. The deck has ample seating with a further 2 small tables, 2 loungers and 2 chair/loungers with foot rests/stools. Totally south facing, the deck enjoys all day sunshine with spectacular views of the small lake and local wildlife. Fishing rods are available for guest use. We have installed a Safe for guest use. We had a fantastic holiday in Orlando in December 2018. Bev was amazing, she was so helpful and friendly throughout the booking process and when we arrived we fell in love with the villa instantly. The villa was lovely and cozy, very well decorated and the sofas and beds were so comfy, my husband and I had our 4 month old baby with us and we had everything we needed. The pool was also stunning and a great temperature despite being December, the lake view was lovely. The location is great, with shops resturants and bars close by and none of the main Orlando attractions are more than 25 minutes away. We had such a lovely holiday that we have rebooked with Bev for 2019 and can't wait to return. Title: Lovely villa in a great location! 18 years and can honestly say this is one of the best we have stayed in. DVDs and a large TV. groceries which was very welcome after a long flight! Review: Heron's rest is a beautiful peaceful villa located at Sunridge Woods which is near Champions gate. It overlooks a lake which features wading birds, the odd alligator and jumping fish and stunning sunsets. The villa is very well equipped and offers every comfort for anyone wishing to experience the attractions or to just relax and enjoy the lakeside views. The villa has a huge driveway so for a 2 car family this was ideal for us. TVs in every room meant we could all relax at the end of the day watching our favourite programmes. We have stayed at other villas over the years but have to confess Bev the owner goes out of her way to help you with your every need. Her customer service skills are exceptional and nothing is too much trouble for her she is always there for you. The information we were given prior to departure was perfect and we had no problems finding the villa at all as the directions were excellent. Having a safe in the villa was a bonus for us this year and the lovely pool was something we enjoyed everyday. There was a rocket launch whilst we were there and this added to our enjoyment. One of the best holidays we have had and we will certainly return to Heron's rest not only for the wonderful location but also for the peace of mind knowing that you have an excellent management company for any issues. Thank you once again Bev we shall return. Review: My family & I would highly recommend staying at Heron's Rest. Bev was very helpful and there was plenty of information with regards the area when we arrived. A very well equipped villa with the use of a sat nav if required. The washer and dryer were a godsend and the games room located in the garage was used numerous times. We loved the pool area and it was very private and quiet with just the sounds of the local wildlife to listen to. We often saw the Heron's beside the lake and the odd squirrel too. The surrounding area itself is extremely well kept and peaceful. Championsgate is near too and we often ate there at the various restaurants, especially Millers. Also close to all the Disney Parks and the nearest Supermarket is Publix. We definitely would not hesitate to stay here again on our next visit to Orlando. Review: Myself and my family have just arrived home after an amazing stay at Heron’s Rest. The villa itself is spacious, comfortable and clean with a beautiful pool which looks out onto a lovely lake. It’s set on a corner plot, so you are not overlooked at all. Every night we enjoyed sitting out by the pool with a glass of wine and watching the gorgeous sunsets. It was so peaceful and the only thing you could hear when sitting out was the delightful sounds of the local wildlife. We did a lot of self catering so was pleased that the kitchen was well equipped with everything we needed. The beds were very comfortable as were the sofas. There were plenty of towels and it was very convenient having the washing machine and tumble dryer in the garage. The kids also loved the air hockey and pool table. We were pleased to see that a Sat Nat was provided as we used a few times when heading out a bit further afield. The villa is situated in a great location, only 25 minutes from all the parks and shopping outlets and just 35 minutes from the airport. Restaurants and supermarkets are only 5 minutes away. We were at Publix a lot! Time went by so quickly and after a few days it really did feel like a home from home. We definitely hope to visit again in the future. I would also like to add that Bev is a fantastic host. She is very welcoming, and any queries were responded to immediately. Review: Stayed at Bevs lovely villa last 2 weeks in June. House is very clean and everything you require is available. 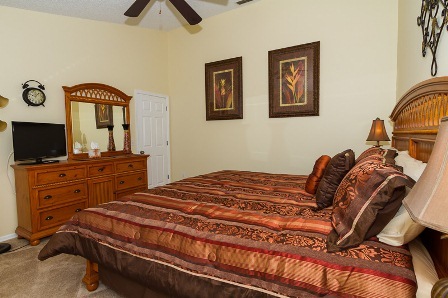 Furnishings are clean and comfortable and plenty of towels as well. The pool is fantastic and the lanai gives so much privacy and space. We probably spent the majority of the time out here with the gorgeous lake view. Bev was very helpful and responsive to all my questions and could not find any fault whatsoever in the whole process. If i get back any time soon i would definately book here again . We have stayed in a number of Florida properties, this villa by far is the best. Situated in a quiet, secluded, estate overlooking a lake this property offers guests a peaceful and tranquil holiday. The villa was spotlessly clean and equipped to a very high standard. With restaurants, supermarkets and parks within easy reach it’s location is suitable for families of all ages. We found Bev to be extremely helpful throughout the booking process and provided us with plenty of information about the area prior to our arrival. 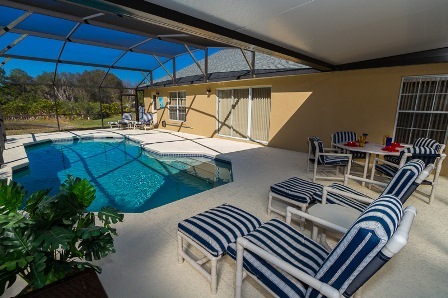 Review: We have been travelling to Florida for many years and have stayed in numerous Villa's over the period. Without question, this is our favourite. 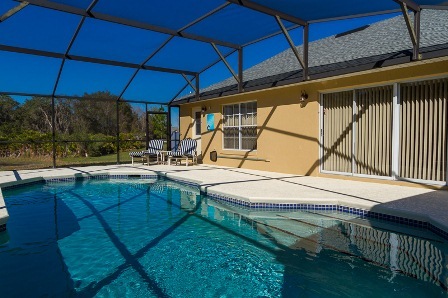 The villa is conveniently located with easy access to the I4, local amenities, Disney and Universal Studios theme parks, not to mention beautiful state parks. The villa is luxurious in every respect, the pool area is South facing with sun all day with a covered area. The villa is equipped with everything you could possibly need. The range of kitchen utensils for example, is excellent. Bev really has thought of everything with things like hairdryers and straighteners. We always make excellent use of the Pool and air hockey table. Its great fun to listen to some music and shoot some pool with a beverage or two. We are booked up to stay for the next few years and will continue to do so indefinitely. Thank you for yet another fabulous stay Bev. It gets harder and harder to leave every time we visit. Review: My girlfriend and I decided to book this villa after a recommendation from my sister who had previously stayed in Heron’s Rest. Both the villa and Bev have been fantastic! Bev was incredibly helpful prior to going and whilst out there. The villa was incredibly spacious, well equipped and spotless. It’s location is also ideal - a very short drive from all of the parks yet superbly peaceful and tranquil after a long day! Highly recommended and we can’t wait to return! Second visit this year, only one month this time! This says it all!!!! Hoping to visit again next year if it is still available. Villa is well situated for whatever you want to do on your holiday..convenient for theme parks, retail outlets or nature reserves. 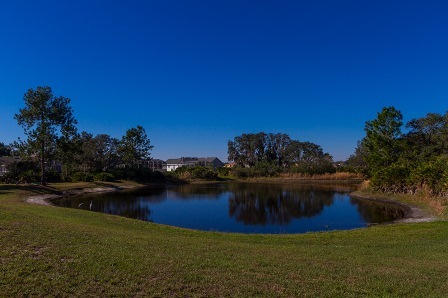 It is on an exceptionally quiet estate, and the view of the small lake from the lanai is both peaceful and relaxing. Villa was well maintained, very clean and well supplied with linen. All in all a great villa and a great holiday! 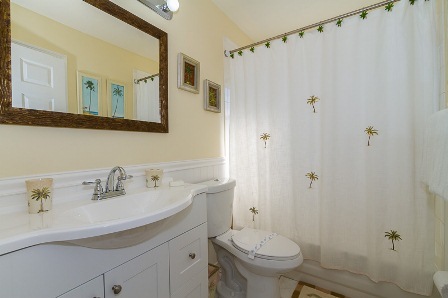 Saw this villa and reviews on VR360 Homes and immediately contacted the owner Bev. Excellent communication between both parties with accurate local information and directions ensuring an easy transition to the Villa. The Villa did not disappoint at all, beautiful and clean with all the amenities you could wish for (had a welcome pack on arrival). Of course the pool area and games room was the kids favourite and used quite often. The villa was set in a stunning and quiet location. We took time out to walk around the estate and see the other villas decorated for Halloween. 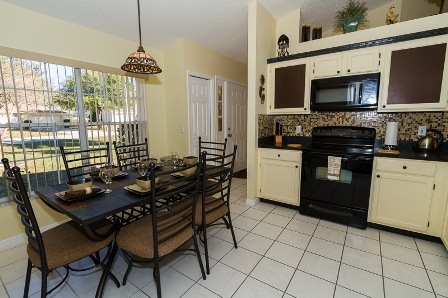 Excellently located with short drives to all the Disney Parks. Can't thank Bev enough for allowing us to stay at this beautiful Villa and would definitely recommend it to family and friends. This is our 3rd time staying at Heron’s Rest, and again we weren’t disappointed. It was everything as we had remembered, the house is well looked after throughout. The pool is an added bonus, with an excellent seating area which has the added bonus of being undercover, which came in handy when a big storm set in and we could still sit outside. The house isn’t too far from Disney World so came in handy after a long day at the parks, water parks and shopping centres. We absolutely love this property, and everything it has to offer, we cannot wait to return again. Herons Rest is a perfect Villa in a great location, it was a great base for us for our 3 week stay. It's located 5 minutes from the main i 4 motorway & close to all major attractions. We are a family of four and had ample room, the kids loved the pool and spent hours playing in it, the games room also comes in handy. 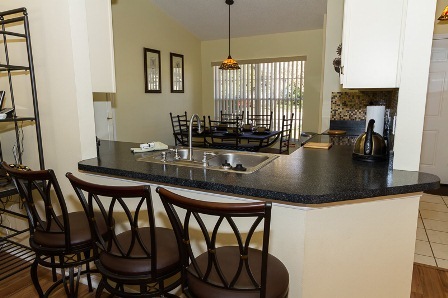 Kitchen facilities are excellent and has everything you need. If you do get time to watch TV there are plenty of channels to watch and picture quality is very good. Air con is brilliant and works perfectly. The owner Bev was fantastic to deal with and nothing was too much trouble, even the daft questions I asked her from time to time! Bev would always reply to my email questions very quickly. I can highly recommend staying at the Villa as it has everything needed and was spotlessly clean, tidy and extremely comfortable. clear instructions even if you haven't been to Orlando before. pool area, spotlessly clean, very private and a lovely view over a small lake. home as it was equipped with everything we could possible need. The villa was very spacious and the area we were staying in was lovely, quiet and relaxing..
just what you want after a long, busy day at the parks! by, we saw an alligator, tortoises and turtles, an otter, an armadillo and huge birds! parks, and had lots of restaurants and shops nearby. we had and was very helpful. 100% be booking again in the future. 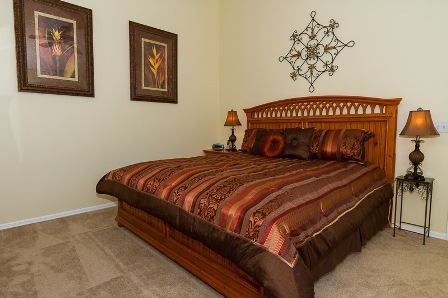 Very comfortable and extremely well equipped with everything you could possibly need . Beautifully decorated and the swimming pool had a lovely outlook over the lake and was very private. Bev sent us plenty of info and instructions which made it was very easy to find. Being with a teenager we enjoyed the games in the garage and the wi-fi was fab. Would recommend without hesitation and would love to return. loved our stay and will definitely return! Title: A Very Satisfied Customer! Review: My wife and I have had holidays in Florida many times over past 17 years, initially with our children and grandchildren and latterly just the two of us. Our most recent stay (Sept 16) at Herons rest was possibly the best we've both enjoyed. For a small party the property is nigh on perfect. Perfect location, sensational sunsets and utter privacy. I'd be surprised if this is the only time we stay there! Hi Bev, a note to say thanks. Your villa was amazing and a real joy to stay in. A lovely spacious layout and great pool. You must have one of the nicest plots on the property, as it's very peaceful with lovely views over the lake. Everything about it was perfect and it was a surprising and nice touch to have the sat nav available for us in the villa. Thanks again. We have just returned from staying two weeks at this perfect home from home. The villa is spotlessly clean and well presented, and exceptionally well equipped. It looks exactly like in the pictures... amazing!!! 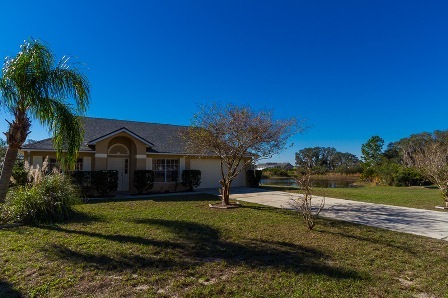 The location is ideal - quiet yet within a few minutes drive of shops, supermarkets and restaurants, and with quick access to Hwy 27 and the I-4 for venturing further afield. The large (and very private) pool deck is fantastic, and the covered area provides a respite from the sun when needed. The view of the lake is stunning, and we never tired of watching the array of wildlife (which even prompted a binoculars purchase lol). We can highly recommend this villa, and will stay here again on our next visit if available. Nothing was too much trouble for Bev. The villa was easy to find and set in a peaceful location with very friendly neighbours . The villa was spotlessly clean and looked exactly like it does in the photos and with the pool heating we were able to enjoy swimming everyday in what we have been told was the coldest February in a decade. The pool is also a great size for swimming with plenty of deck space around to lounge or eat. The villa was fully equipped and we had a great 4 week break there. We are definitely thinking of booking this villa again next year. From the second we pulled up on the driveway to the second we pulled away from it, its been amazing. The villa is stunning in both decor and location a real home away from home and we felt at home right away. Its set out beautifully. The massive pool deck is brilliant for enjoying the pool and a nice relax around it. Me and my brother enjoyed the lake alot of fishing catching alot of fish. Bev is an amazing owner and nothing is to much trouble for her. The one downside.. we have to go home!! Thinking of booking?? Then do it you wont regret it. Dear Bev , Once again we had a fantastic time in one of your Rental Villas, thank you. It had everything you could wish for and more and was very clean and tidy. This as our second visit to Florida and we enjoyed every minute of it although exhausting some days we thoroughly enjoyed it. We had some great meals at Chillies, Millers Orlando Ale House, Bahama Breeze and many more, the food was always great and plenty of it. We did Universal both Islands of Adventure and the Studios and had a fabulous time. We went to the coast this time down to Clearwater and although it was so hot we had a great day at the beach. Once again Bev thank you so much for letting us rent one of your Villas again, I would to both Family and Friends they are perfect. My sons and I travelled around a part of Florida for 3 weeks in July/August of 2015 and stayed at Heron’s Rest for a week. After the hotels, the villa was a true home away from home. Very clean, private and welcoming. We arrived on a Sunday and although I knew about the Florida pool alarm, I had no idea how to turn it off. Didn’t really want to have to call the management on a Sunday but I had 2 kids that couldn’t wait to get into the pool! A quick call and we were sorted. Even though it was Sunday I didn’t feel I was intruding which was a relief. Many thanks to Bev for the kind communication and the swift and correct handling when making the reservation as well as the return of the deposit afterwards. The kids and I had a holiday of a lifetime! Really nice villa that has been refurbished to a high standard. 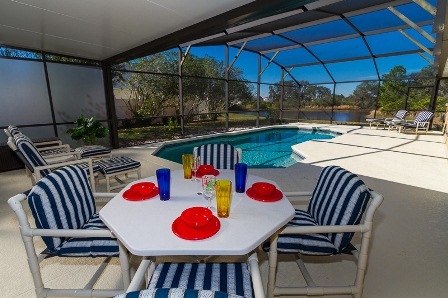 Good sized pool with spacious lanai and plenty of room for 6 guests. We've stayed at Sunridge Woods a number of times and this property is really good quality - in some ways the photos don't do it justice. Ideal for anyone wanting to explore Florida or do all the theme parks. We had a wonderful stay at Heron's rest, excellent location for theme parks, shopping etc The villa was nice and clean on arrival and very well equipt for self catering if you don’t want to eat out all the time, the pool area was wonderful it was so lovely to sit outside and admire the view across the lake also you are not overlooked at all it was very peaceful after a crazy day out at the theme parks many thanks to Bev for letting us stay at your lovely villa we did not want to go home. This is a superb villa well equipped and location is ideal for all of the parks. Very private and close to local supermarkets and food outlets. Would highly recommend this villa and already looking to book again!! We had a brilliant holiday in Orlando and the villa we stayed in was stunning.It had everything we could possibly need and more.The owner gave us lots of info on places to eat,shop, and visit and the management team were first rate too.Many thanks to you all for a fantastic holiday. Have just returned from holiday,stayed at the Herons Rest. 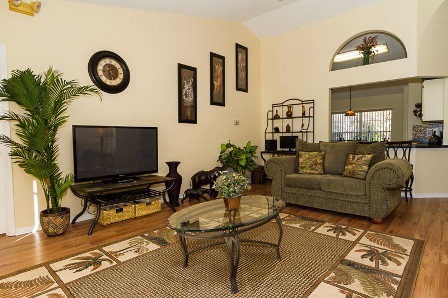 From the moment we arrived it was pure delight, the property is ideal for visiting all around Orlando. Herons Rest is a 5 star home, has everything you could wish for. Did not want to leave. We are all now safely home. I wanted to thank you for letting us have the use of your lovely vacation home. We have stayed in Florida on a number of occasions and have stayed in villas for all but one when we stayed in a condo. The villas we have stayed in have all been comparable in price to yours however that's where the comparisons end. 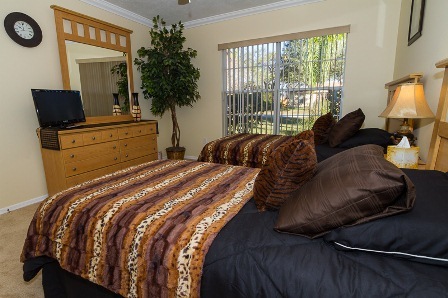 We have just enjoyed our BEST trip to Florida and that was down to the fact that your villa was so nice and comfortable and the communication and ease of dealing with yourself. Also helped having such a picturesque location next to the lake(nothing to do with the fact both my son and myself enjoy fishing!). We were at the lake daily fishing and caught some strange looking fish and some very snappy turtles. No animals were hurt in the making of this email they all went back safely. Once again a HUGE THANK YOU from Susan,Nadine,Dylan,Stuart and myself for helping us to have such a great vacation,oops I mean holiday! We had a perfect vacation at Herons Rest. The home is beautiful, very clean, very quiet and safe neighborhood. 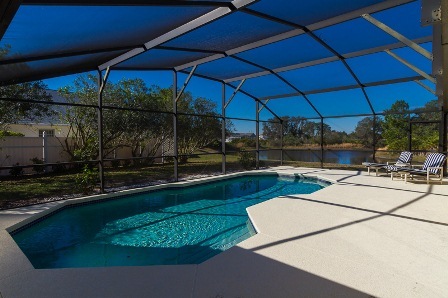 Wonderful pool with screened lanai and a great view of the pond in the back yard. The pool area is very secluded with no neighbors to hear or see. The pond is alive with fish and birds, not a stagnant wetland. We had daily visits by a pair of Sandhills Cranes. Close to Disney, 20 minutes. Close to shopping, 5 minutes. Very comfortable beds, and more beach towels than the Marriott! 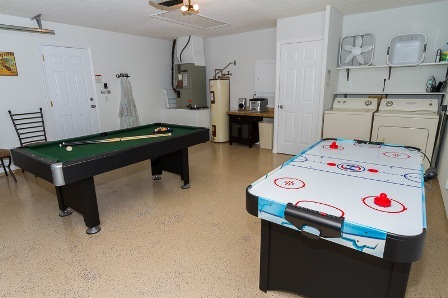 Wifi, Wii, pool table, air hockey, fishing poles, laundry center. Well equipped kitchen. I hate to give it a 10 for fear of having it already booked when next we return, but a 10 it is. Fabulously furnished property in quiet area not overlooked. The pool area is superb and the whole property is tastefully decorated throughout with everything you need to make you feel at home. 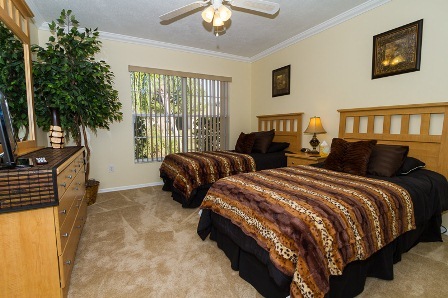 Ideally located for Disney parks and Universal about 20 mins drive. Bev has been most helpful from day 1. Go ahead and BOOK you won't regret it! Everything we'd wished for and more!! This was our first visit to Orlando and the villa was fantastic! 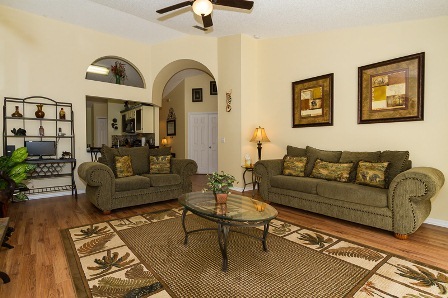 The location was perfect for Disney and Universal and it was situated on a beautiful, quiet community. It really was a home from home, every detail was thought of. My only complaint is that we had to leave it when the holiday was over! After 20 years of vacationing in Orlando I think we have found the Perfect villa. The owners have recently purchased and upgraded the villa and it shows. Everything looks and feels new, from the carpets, flat screen TVs, and bedding right down to simple things like quality crockery and utensils. It certainly feels like no expense has been spared. 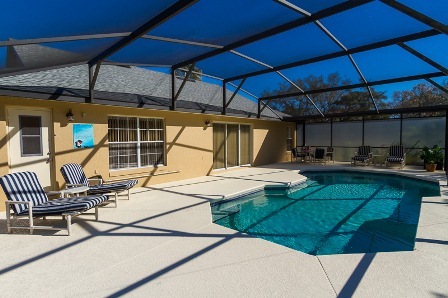 Outside the pool is immaculate and the deck is oversized, but our favourite addition is a private lanai area which is perfect for shade from the sun. The villa is very private and the pool area offers a lovely view over the private lake. We loved staying at this very tastefully furnished home in a quiet residential area. The house is on a large corner plot and the large south facing deck and pool are not overlooked by any other property. The deck gets sun from early morning until late with beautiful sunsets over the small lake which is home to pairs of Grey Herons. 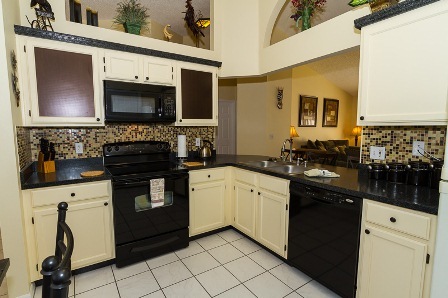 It is easily accessible from Interstate 4 with local shops only a few minutes away and all of the Disney attractions can be reached within 15 - 20 minutes. We would have no hesitation in recommending this house to other families and hope to return soon. We really enjoyed our stay in Herons Rest, a spacious villa and pool in quiet location overlooking a lake, fully equipped to a high standard and beautifully decorated. Good info, easy to find, spotlessly clean and the 3 bed layout with 1 bedroom on one side and 2 on the other side is ideal for either 2 couples sharing or a family with children. 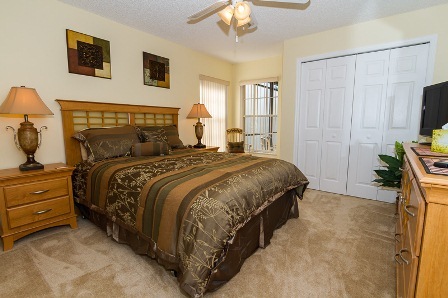 Easy access to Orlando and Kissimmee and good restaurants - Applebees, Chilis, Bahama Breeze. Excellent value for money. We would highly recommend this villa.